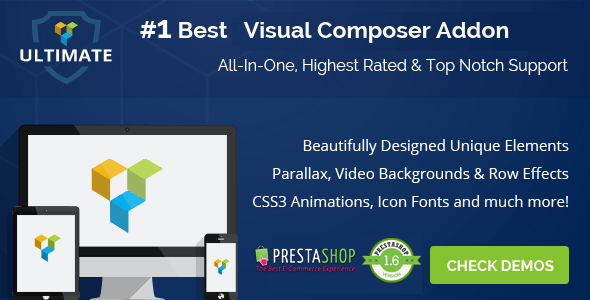 Ultimate Addons for Prestashop Visual Composer Created by smartdatasoft. This templates have specific characteristics, namely: Ultimate has features such as High Resolution: Yes, Compatible Browsers: IE9, IE10, IE11, Firefox, Safari, Opera, Chrome, Software Version: PrestaShop 1.6.0.x . You can use this Ultimate Addons for Prestashop Visual Composer on Plugins category for flip box, font awesome, font icons, icon list, icon manager, info box, info list, Logos Interactive Banner, milestone counter, modal, popup, stats counter, vc addons, visual composer and another uses. This plugin adds several premium elements in your Visual Composer on top of the built-in ones given by Prestashop Visual Composer. Every single element in the package is crafted with utmost attention to details and a simple objective to provide you an ultimate experience. We?ve put a lot of time and care to ensure that all the elements are flexible so that they will open limitless possibilities for you, while maintaining simplicity at the core. Icons ? You can use this element to integrate a simple icon (font & image, both kinds) in your page and use it as you want. Or you can utilize Visual Composer grids and display a list of logos of your clients, partners, sponsors, etc. Info Box ? Perhaps, the most popular trend right now, Info Boxes truly make your website stand out helping you highlight the important things you have on offer. Info List ? Traditional HTML lists are boring, aren?t they? This elements simply re-imagines the lists. You may take an opportunity and utilize it?s cool design to show some process or simply highlight your most popular / related products, services & features. Flip Box – This element combines the power of ?Info Box? & ?Call to Action? block altogether. On the front, it would look like a normal Info Box but as visitor hovers on the block, it flips with a cool CSS3 effect and shows a Call to Action section, provoking him to take a call. Modal Popup Box ? This is one of the very useful element that can go on any website. Create modal popup boxes and embed anything you wish inside the popup box through easy WYSIWYG editor. Extended Google Maps ? Visual Composer comes with Google Maps element by default. But our Extended Googles Maps element uses latest APIs and allows you to do more with it. Upload marker images, write custom HTML in map info box and control everything that goes with map. – Keeps the image fixed at it?s position while the other content moves on scroll. We?re already working on few more elements that we look forward including in this plugin as we complete them. We want to make this plugin as an ?ultimate? source for you to get most of the essential Visual Composer addon elements in one package. The long wait has finally come to an end?Introducing, Prestashop Icon Fonts Manager! Customize Your Own Icon Fonts ? We understand you don?t use all those hundreds of prebuilt unnecessary icons that come with any of those popular libraries like Font Awesome, Entypo, etc; but you care more about only the few ones that relate to your business more. That?s why, we?ve made our Icon Fonts Manager very compatible with the famous IcoMoon?s APIs where you can create your own customize font by shortlisting your favorite icons from the choice of FREE 2500+ icons! If those 2500+ icons still fall short, IcoMoon will still cover you with their amazing feature that helps you convert your SVG designs in the Icon Fonts. Real Time Icon Search –Okay, many of us would like big numbers & more choices of icons, wouldn?t we? Though this choice is really very fancy, it certainly comes with a pain as we can?t easily find the icon that we are looking for when we need it. And that?s why we have integrated a real time search feature which can help you sort through all the Icon Fonts you have in your library very smartly. After working so hard on this plugin for last few weeks, we believe we have ?nailed it?, and have come up with a truly essential solution that would benefit all the Visual Composer users. We fancy the Icon Fonts Manager part of this plugin very much as well and hope that you will love it as much as we do!